Most of us have had a situation where we’d like to try some new dishes but can’t read everything on the menu. 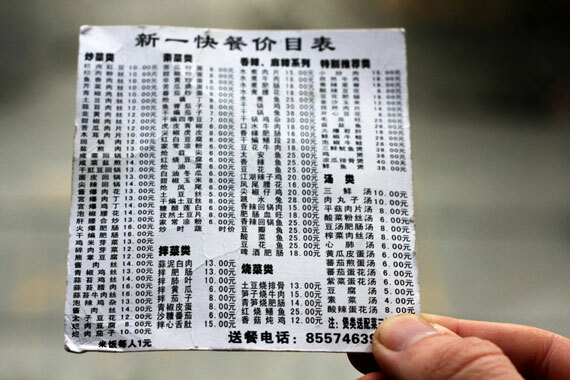 To fix this problem and learn some new Chinese, we’ve translated the menu of a local restaurant in Chengdu, Sichuan’s capital city. If you find yourself always ordering the same dishes because you can’t read the menu entirely, start learning this vocabulary and try these dishes out! In contrast to “Szechwan Cuisine” served outside China, in Sichuan Province, most dishes are stir-fried in lots of vegetable oil with garlic, ginger, either green or red hu?ji?o and a small amount of sugar, salt and MSG. You’ll have to specify to your server if you want your food non-spicy or without MSG (see #2 at the end of the article for these phrases). Unfortunately, chances are fifty-fifty that your message will be forgotten or ignored due to the rarity of special requests made in Chinese restaurants. The categories below each assume the above ingredients, plus their preparation as further described. So you can pronounce these as correctly as possible, we’ve included tone indicators on the pinyin. Listed as well are three of the “Big Four Sichuan Dishes,” below. The fourth just wouldn’t fit into any of our categories. See if you can get your name first with the name of the dish on the comments list below! ???? Lànròu Ji?ngdòu has cow-peas and possibly a few dry red chilly peppers. ???? Lànròu F?ns? has glass noodles made from sweet-potato starch. ???? Lànròu Dòuf? has soft tofu. ???? Lànròu Qiézi has Chinese eggplant. ???? Yúxi?ng Ròus? has mu’er (#3 below), qingsun lettuce stalks, pickled red chillies, pickled ginger and douban sauce (#4 below). It is one of the Big Four Sichuan Dishes. ???? Qíncài Ròus? has celery. ???? Q?ngji?o Ròus? has anaheim peppers. ???? T?dòu Ròus? has potatoes. ???? Suàntái Ròus? has crispy garlic stalks. ???? Jíuhuáng Ròus? has yellow leeks. ???? Tiánji?o Ròus? has sweet pepper. (?)??? (J?ng) Ji?ng Ròus? is fried in duck sauce with fresh spring onions on top. ???? Q?ngji?o J?s? is a chicken version of Q?ngji?o Ròus? (see above). ???? Suàntái Làròu is the bacon version of Suàntái Ròus? (see above). ???? Suàntái J?s? is a chicken version of Suàntái Ròus? (see above). ????? Suàntái Níuròus? is the beef version of Suàntái Ròus? (see above). ???? Gu?b? Ròupiàn starts with a large plate of dry, unflavored, rice-crispy-treat shaped squares of glutinous rice. A starchy stew of pork, mù’ér, q?ngs?n and other vegetables are then poured over squares to start a snap-crackle-and-pop sound. This is another of the Big Four Sichuan Dishes. ??? Yánji?n Ròu is fried with garlic sprouts (#5), with a name implying that this dish is on the salty side. ???? K?gu? Ròupiàn is mostly bitter melon. ???? Xióngzh?ng Dòufu has firm tofu, garlic sprouts (#5) a little black vinegar and dòubàn sauce. ???? Xiáncài Huígu? has a chopped, brown, pickled mustard stock (#6). ???? Ji?nji?o Huígu? has green Anaheim peppers. ???? G?ngbào J?d?ng is another of the Big Four Sichuan Dishes, with tender little cubes of chicken meat and red and green anaheim peppers. ???? G?ngbào Ròud?ng is a pork version of G?ngbào J?d?ng (see above). 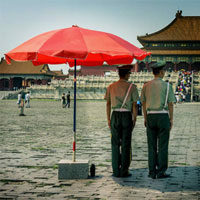 This section was translated by Jiao Jiao – thanks! Which do you think we should move to first? Soups, fried rice, dumplings & noodles? Thanks for the plugin, something I have needed for a long time. Good post. that is so right! Even the native speaker can not really distinguish them. Good work Reid. I didn’t realize LanRou described those little bits of meat sprinkled in the dishes. Thanks, I just organized it this way because I was didn’t want to repeat the same descriptions of ingredients in every dish. Also, Eli, I think you’ll be happy to know that your 100 kuai bet was well-placed at the restaurant last night–I managed to make it home before feeling sick for about two hours. After weighing the costs and benefits, I think drinking a cup of wasabe oil is worth about a hundred kuai, just not after finishing a delicious meal at 天添. I’m not familiar with that dish – it’s not on this menu. Never heard of it before – what is it? Oops – we forgot to give credit to Jiao Jiao who helped us translate the list of stir fry menu items at the end of the post – thanks! This is awesome! I will order something new from here tonight. Very helpful. Thanks a lot. Please tackle some other parts of the menu as well when you have a chance. Absolutely, we will do that. It’s been too long! I found this a great help, when is the next one going to be available? I’m working on a cooking ingredients list, focusing on the brands of ingredients that make Sichuan cooking taste so good. It’s good to see someone thninkig it through. This is great! I’m visiting Chengdu for the first time in mid-September, and would like to explore Sichuanese food. Please post the translations for the rest of the menu. I (partly) converted the list of Sichuan dishes into flashcards for your Pleco App (if you have one). 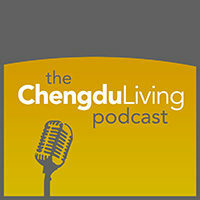 Keep up the good work with ChengduLiving, love this site! Hi, actually I am looking for Sichuan chefs. Am very keen to open a Sichuan Resturant in HK. Can u help or guide on how I maybe able to do this. How do I say “no pork please”? wǒ bùyào zhūròu. jī ròu, niúròu dōu kěyǐ.